Do the puppies have any type of socialization prior to being sent to their new home? It's critical that the puppies are socialized and introduced to different situations from very early on in their life. This will make them grow up as a confident adult that is a joy to be with and will eliminate a lot of behavioral issues. I take special time to do that with the puppies early on from the very first weeks in their lives. A true Dogo Argentino will make an excellent therapy dog, I have experienced that personally. I have enjoyed the dogo argentino breed so much that I want other people to enjoy it with me and I also breed to maintain the health of the adult Dogos. I typically breed once a year or less. Click here to view my upcoming litter. Can I meet the dam and sire? Arrangement can be made to meet the parents and I actually do encourage that. For information on my dogs visit My Dogos. I am located in Minnesota, and visits occur at my house. What happens to your retired breeding dogs? These dogs are not on a job. They are family members and will remain family members whether they are breeding or not. They are very easy to train and whatever they learn they remember forever. They respond very well to gentle playful, purposeful training by their owner. So it is best that you train them yourself. They need regular exercise to keep their superb muscle structure in shape. How old will the puppy be before he acts like an adult dog? As a member of the mastiff family they mature at the age of 2 years. They get along well with other animals as long as they are introduced to them from puppy- hood. They are generally a very healthy breed. They are prone to pigment-related deafness with a 10 % prevalence rate. Parents that do not have this issue will greatly reduce this incidence. The puppy will be B.A.E.R. tested (Brainstem Auditory Evoked Response) and the test results will accompany the dog. I have excellent bloodlines, puppies with health issues will not be sold from the start. When they are fully mature, they will weigh between 90 to 110 pounds with males being slightly larger than females. What is the average lifespan of the dogs? Typically Dogo Argentinos live for 12 years. What type of food do you feed your dogs? Detailed information will come with the puppy. This is not a barking breed. They bark only when there is something wrong. Do you crop their ears? The creator of the breed Dr. Antonio Nores Martinez insisted that the dog ears should be cropped. They have to be done before a certain age. It prevents recurrent ear infection especially if the dog is going to be in the water frequently. If the dog is going to be used for protection, it looks more impressive. As a hunter it is also functionally better. I have spared no expense to produce a Dogo Argentino with the exact temperament and standards as set by the creator of the breed Dr Antonio Nores Martinez. Any deviation from these standards will produce a different dog than envisioned by the creator of the breed and ultimately will lead to the destruction of this wonderful breed. The price of the puppy will be used to maintain and uphold the breed standards. Prices will be given upon request and each puppy will be priced individually. When do you release the puppies? Puppies are released at the age of 12 weeks after they receive the second set of necessary vaccines. What is the payment arrangement? A deposit is required to reserve a puppy. Puppies are sold by a binding contract between the seller and the buyer that clearly indicates all the transaction. They are excellent watch dogs and will protect their owner and property in a measured response to the level of threat. Are they good for Schutzhund? This is not the best breed for Schutzhund. This is a very smart breed that exercises their own judgment. They bond strongly with their owner and will do their best to please him/her. They are easily trained. How can I reserve a puppy? In order to reserve a puppy you will need to send a deposit. This will guarantee you a puppy in the upcoming litter, as long as the number and the gender of the puppies allow. 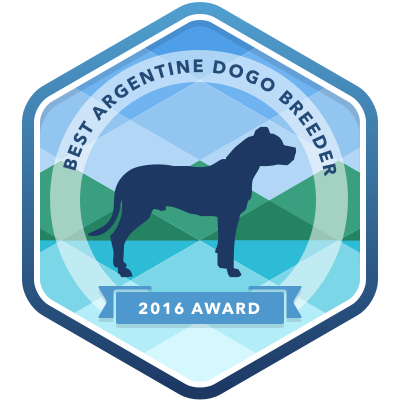 Breeding a Dogo Argentino to the original breed standards of Dr. Antonio Nores Martinez is a huge undertaking that requires a lot of planning, selection and vetenary care. Once you have put a deposit and made reservation I have to reject other offers. Therefore, the deposit is nonrefundable. If you have been offered a puppy and you decline it, the deposit will also be forfeited. Yes, I will ship Dogo Argentino puppies. I am located in Minnesota, but will ship across the Midwest as well as Alabama, Alaska, Arizona, Arkansas, California, Colorado, Connecticut, Delaware, Florida, Georgia, Idaho, Illinois, Indiana, Iowa, Kansas, Kentucky, Louisiana ,Maine, Maryland, Massachusetts, Michigan, Minnesota, Mississippi, Missouri, Montana, Nebraska, Nevada, New Hampshire, New Jersey, New Mexico, New York, North Carolina, North Dakota, Ohio, Oklahoma, Oregon, Pennsylvania, Rhode Island, South Carolina, South Dakota, Tennessee, Texas, Utah, Vermont, Virginia, Washington, West Virginia, Wisconsin, Wyoming. For questions regarding shipping Dogo Argetino puppies please contact me.